The "Dakota Express Pipeline", proposed in June 2013 by Koch Pipeline, will not be built according to a Bloomberg report. The project included a 250,000 b/d pipeline to transport oil out of the Bakken in Western North Dakota to receipt points in Illinois. "the non-binding open season for the Dakota Express Pipeline is no longer being pursued"
Pipeline companies prefer to have long-term, binding commitments for capacity. If commitments do not reach a certain point, the project will be called off. As a very loose rule of thumb, pipeline companies look for commitments of 60% or more of designed capacity before they move forward. In this case, that could mean Koch failed to receive commitments for 150,000 b/d. 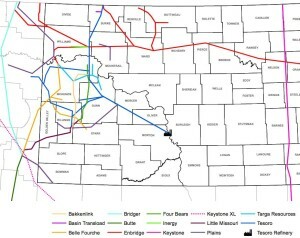 This isn't the first proposed pipeline to get canceled: Oneok canceled plans for the Bakken Crude Express Pipeline in late 2012. The Koch cancellation is surprising considering there is more than 500,000 b/d of oil moving by rail out of the basin today.